Summer is close. Can you feel it? I think it’s hiding just beyond the gray clouds that have been dampening my spirits for days. Go away, clouds! I’m ready for sunshine and long days by the pool. Margaritas and late walks with Cookie. Potlucks full of fresh salads. 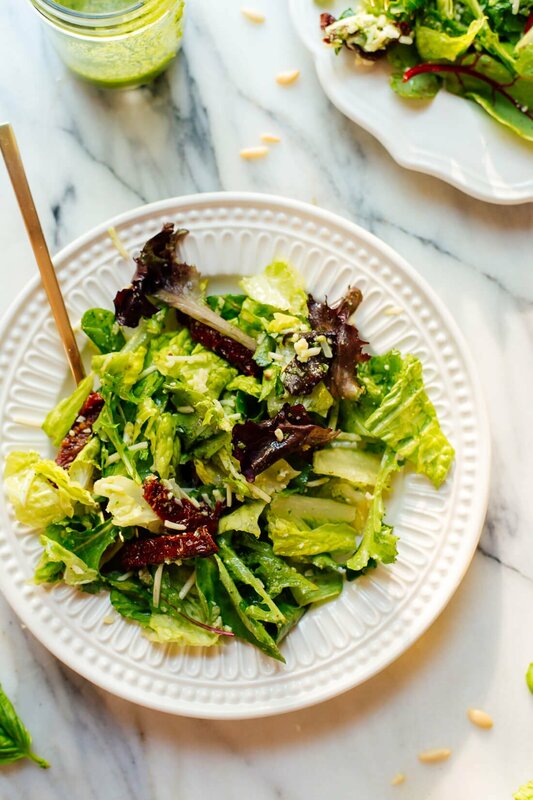 Since I often pull up my own salad archives to find a simple recipe and then kick myself for making my salads so involved, I thought I’d share a simple, summery dressing today. 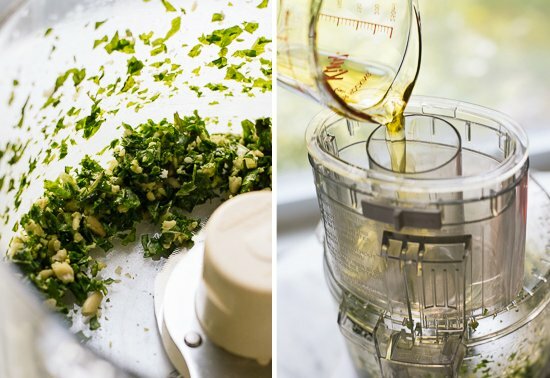 It’s inspired by classic basil pesto (basil, pine nuts, olive oil, garlic and lemon) and comes together in just a few minutes in your food processor. I typed up a list of mix-and-match ingredients that should go well with it, too. It’s a build-your-own summer salad extravaganza! I’m inevitably in a hurry when I make salads for potlucks and girls’ nights, so I’m pretty excited about a new-to-me option offered by DeLallo Foods. They are my favorite source of sun-dried tomatoes, marinated artichokes and olives, not to mention whole wheat pasta. 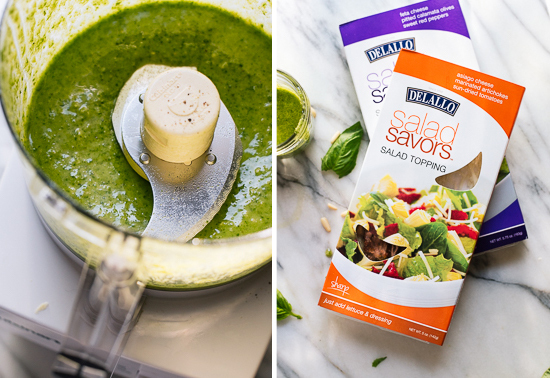 DeLallo packages up salad-sized portions of themed complementary flavors called SaladSavors, so you can just combine them with fresh greens and a dressing of your choice. Boom! Salad’s ready. I threw together the salad you see here in about five minutes flat, thanks to DeLallo’s SaladSavors in Sharp Asiago. I say thumbs-up to making salads easy and eating more greens! Let me know what you pair with this dressing! Be sure to snap a picture and post it on Instagram with the hashtag #cookieandkate. I can’t wait to see all of your summer salads! 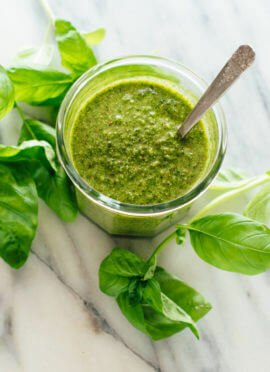 This simple basil salad dressing takes cues from pesto and pairs marvelously with green salads, Italian/Greek flavors and a variety of bold, summery flavors. Recipe yields about ½ cup dressing and keeps well for up to 10 days. 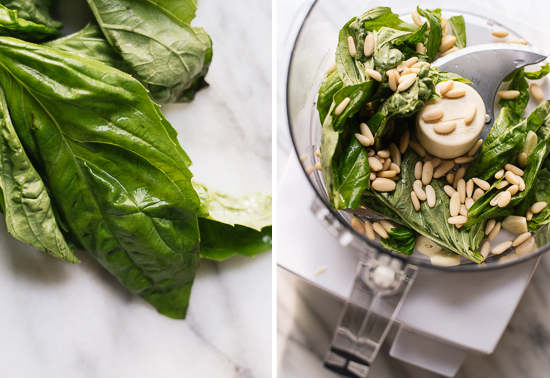 In the bowl of your food processor (a blender will probably also work), combine the basil, garlic and pine nuts. Pulse until coarsely chopped. While the machine is running, drizzle in the olive oil, lemon juice and salt. Season to taste with freshly ground black pepper and blend until smooth. For best flavor, use immediately, or cover and store in the refrigerator for up to 3 days. Storage suggestions: This dressing is best served immediately, but will keep in the refrigerator, covered, for another day or two. Change it up: Feel free to play around with the herbs and nuts used in this recipe! Mint or cilantro would be lovely additions or substitutions. 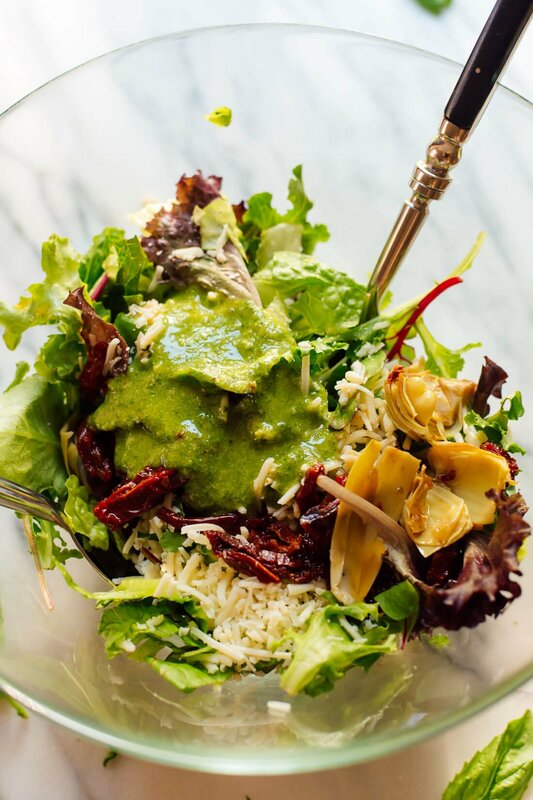 The pine nuts blend right into the dressing, which is nice, but you could also experiment with almonds, cashews, pepitas and sunflower seeds. Disclaimer: This post was created in partnership with DeLallo Foods and I received compensation for my participation. Opinions are my own, always. Thank you for supporting the sponsors who support C+K! I’m pretty sure that you just created the world’s best dressing! I will devour anything “pesto,” and I’m betting that this recipe will be a keeper this summer! Pinned! Yes, I think walnuts would be great! Hope you love the dressing! This looks incredible! I’m a huge fan of pesto, but always on spaghetti. Of course it goes well on salad, why didn’t I think of that? It would significantly increase my salad intake! YUM! I’m also going to use it in a veggie lasagna recipe that calls for a layer of pesto. Yum! It was delicious! (ended up using sunflower seeds). I often add fresh basil to my salads and my basil plants are already quite hearty so I can’t wait to give this a try! Delish!! This looks perfect for all of the fresh tonatoes coming in season. I made this tonight for dinner exactly as the recipe is written and it was fantastic. Thank you!! So…I feel like I’m going to spend my summer pouring this vinaigrette all over ALL THE THINGS. And I love it. This is literally just pesto tossed on salad. It is in no way by definition a “vinaigrette” as it contains no vinegar. I make pesto by mortar and pestle and always have some on hand. 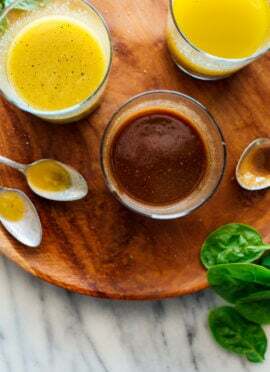 I came looking for a vinaigrette to make things interesting and try something different on a salad but cannot help but leave this site disappointed. You should really rename this to Basil Pesto Tossed Salad. Erika, I’m sorry you’re disappointed. I would have called it a citronette, which is more accurate, but most people don’t know what that means. I used lemon juice because it tasted better than vinegar, so I certainly don’t regret that. That was my thought. Its a good pesto, but I was very confused by the complete lack of vinegar. Im just going to try adding balsamic vinegar to it at some point. Its a good pesto though. This was very good! I will be making a lot more of this in the future since my basil plants are going crazy with all the rain, and now heat, that we’ve had in St. Louis. Thanks, Kate! Thanks, Jayme! So glad you enjoyed it! I made basil pesto several years ago according to your recipe. It was vegan (recipe called for cashews instead of cheese, I believe). It was so good. Even my little ones enjoyed it. I have tons of basil growing and kids are asking for the SAME basil pesto, however, I can’t find it on your site. Would you be so kind and send me (or post) the recipe again? Thanks. Hi Mimi! 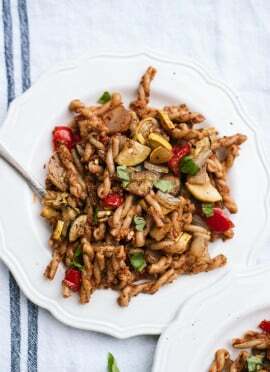 To the best of my memory, I’ve only used cashew in pesto in this recipe. I’m not sure that’s what you’re looking for! Here’s my oldest recipe for pesto, which is made with basil and walnuts. Glad you’re enjoying the salads, too, Vicki! Just pinned this recipe! We are starting to really get into salads now that the weather is so much warmer and I’m sick of all the artificial stuff in stores my kids like. Making this tonight! Hi SJ, I’m sorry to hear that. You might try your pine nuts on their own—have they gone rancid? When nuts or seeds go bad, they taste bitter, so that could be it. Otherwise, I don’t know what went wrong. Sometimes adding a little more salt can cut bitterness. Very good. I made a kale, basil, mint pesto this morning. I used walnuts, 1/2 cup of Parmesan cheese and 3 cloves of garlic in the pesto. 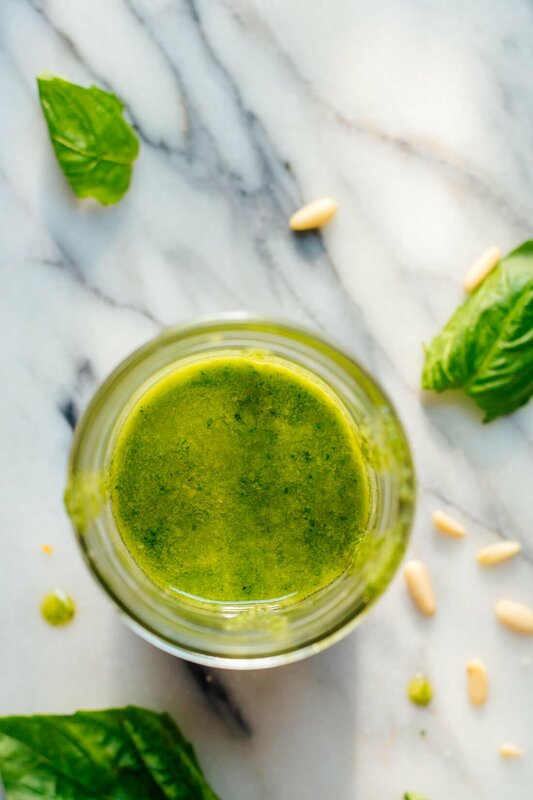 I actually combined two pesto vinaigrette recipes – I added a couple teaspoons of white vinegar to your recipe. Oh my goodness, that sounds delicious, Melissa! I’ll have to try adding mint. It is good. I had picked up a package of mint at Trader Joe’s and thought why not add it to the pesto and it worked. Would green peas, mint and almonds make a good pesto? Would I need to defrost frozen peas first? I quadrupled the recipe, but added only three T lemon juice, one cup plus one T of olive oil plus two T of Parmesan cheese. DELISH! Up to 3 days it will last, but is best immediately. I hope this helps, Patricia! I always find myself landing on your blog cause I love veggies too! Keep creating! Hello to Cookie! Thank you! Love to hear that.